Oxygen-free radicals are thought to play an essential role in senescence. Therefore, the expression patterns of the small gene family encoding the H2O2 scavenging enzymes ascorbate peroxidase (APX; EC 1.11.1.11) were analyzed during senescence of Arabidopsis thaliana (L.) Heinh. Applying real-time RT-PCR, the mRNA levels were quantified for three cytosolic (APX1, APX2, APX6), two chloroplastic types (stromal sAPX, thylakoid tAPX), and three microsomal (APX3, APX4, APX5) isoforms identified in the genome of Arabidopsis. 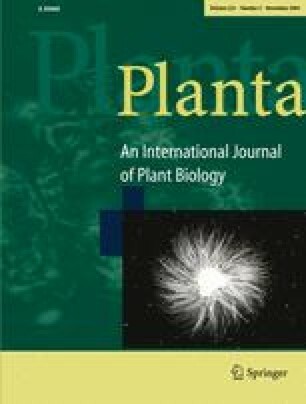 The genes of chloroplastic thylakoid-bound tAPX and the microsomal APX4 exhibit a strong age-related decrease of mRNA level in leaves derived from one rosette as well as in leaves derived from plants of different ages. In contrast to the tAPX, the mRNA of sAPX was only reduced in old leaves of old plants. The microsomal APX3 and APX5, and the cytosolic APX1, APX2, and APX6 did not show remarkable age-related changes in mRNA levels. The data show that expression of the individual APX genes is differentially regulated during senescence indicating possible functional specialization of respective isoenzymes. The hydrogen peroxide levels seem to be controlled very precisely in different cell compartments during plant development. We thank Prof. Dr. Friedrich Schöffl, ZMBP, University of Tübingen for support and critical discussion and Heike Spiekermann for technical help. We also thank the NASC (Nottingham Arabidopsis Stock Centre, University of Nottingham, UK) for supply of Arabidopsis thaliana, ecotype Col0 seeds. This work was supported by Sonderforschungsbereich 446 of the Deutsche Forschungsgemeinschaft.